The duplication exploit in the Dragon Soul patch of WoW: Cataclysm ruined the market for ar least rare socketable gems, crafting materials and previously rare mounts. It was obscene, and while I was playing Blizzard did not acknowledge it. People aren't mad about the short-term impact of this bug, although they are correctly worried about how Zenimax will handle it. The anger comes from the thousands of players who played during the beta and reported bugs, even this specific dupe bug, only to have their bug reports completely ignored. 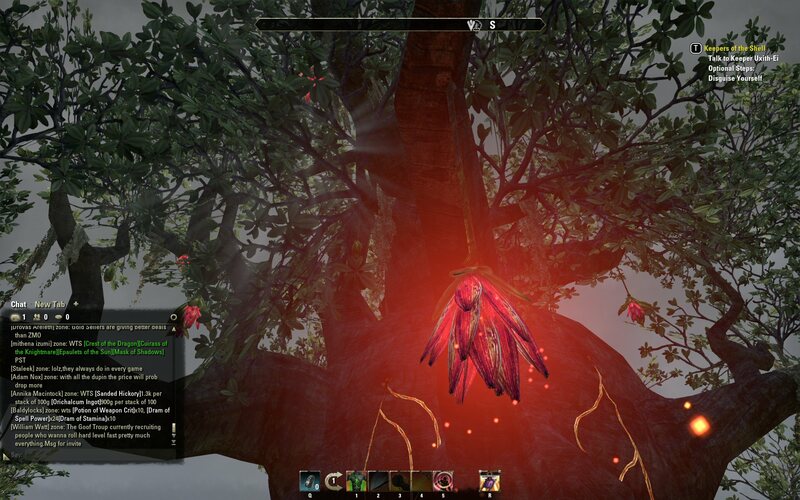 They watched as this completely fixable bug was ignored by Zenimax and made it into the retail version of the game. This level of developer negligence is completely inexcusable. It also leads to speculation about how broken the game really is. Developers prioritize their time, so if an economy-breaking dupe bug that they knew about was not a high priority for them, what bigger problems aren't we hearing about? I agree that this is the main issue players should be concerned about. It's certainly the one I am! All game trees are doomed to be compared to the Pale Tree in Guild Wars 2, and they'll all fall short. I like the Wyrd Tree in Glenumbra too. I think I've got a shot of the Elden Root city tree around somewhere, but I don't appear to have uploaded it. It's another very impressive tree, though. GW2 sure is pretty. I need to take another look at it after this CSM thing is done. What matters is not that this bug happened. It's how Zenimax reacted to it. Specifically how long it took them to react at all. If this is how long they take to implement a quick and dirty fix, how long will it take them to reactivate the guild bank with the exploit closed ? How long will it take them to work on less important problems like the client crashing ? Will they even do what they need to for the game economy to recover ? Yes, you do say that you haven't seen any effects. Which might be because we are talking about effects that were there since launch and/or it might be that the trade systems in ESO don't react to changes as quickly as Eve's market does. It was apparently reported using /bug in early February. If true, the guild bank should have been disabled on launch. It was apparently talked about on the forums a week before the guild bank was disabled. A post that got deleted, which means that someone in Zenimax had read the post in question*. That's far too long to leave that exploit open when a quick fix is available. Lets compare that to another dupe exploit I remember, back in Guild Wars 1. I went to bed before anything about the dupe had gone public. When I woke up ANET had received a report on the exploit, closed it and run a script to ban anyone who had duplicated anything. The only anger was over ANET's script banning the person who reported the exploit. Which was mainly because he didn't include his account details in the email to support. He was unbanned quickly. *Or the moderators are deleting posts without reading them. There used to be one on eve when it first come out. If there was lag you could drag and dup items. That bug was fixed quickly. Can't help but notice that, of your last five posts, only one is about EVE Online. Given the obvious displeasure your constituency has for the industry changes you supported, I can see where writing about EVE might be unpleasant. However, you pulled in a lot of high sec votes for CSM and, though your term is ending, many of them feel your final act was a slap in the face. They were deliberately blindsided by both CCP and the CSM. This is a foundational change that very evidently has very evidently not been carefully thought through. I think you need to listen to them them rather than writing them off as some negligible fringe of the EVE community. That is insult after injury and they certainly deserve better of you. Dinsdale, is that you? If Jester writes about other games than this is because its his blog = his rules. Actually, calling things 'Godwin's Law', that aren't, as a way to claim victory, is the real new variation on Godwin's Law. I'm writing about other MMOs because absolutely nothing is going on in EVE. I could fill in with some padding, I suppose, but I have no inclination to do that. I'm not the only one having this problem, either. Of the 27 posts on TMC's front page this morning, nine are EVE-related, and two of those are padding. That said, I don't consider my EVE mail announcement to be a "real" blog post and I disagree with you that the "Minecraft" post had nothing to do with EVE. As a result, I'd say three of my last five posts were EVE-related. Jester: "I'm writing about other MMOs because absolutely nothing is going on in EVE." I'm just going to jump in here and say my playstyle so far in Eve has been primarily doing things in highsec. I have no nullsec alts. I do have some friends in null and they always want me to go join them, but my time online is too limited to commit to that. Nevertheless, I like the changes coming to industry. People will adapt to them. They are, imho, overall good changes for the game in the long run. Percentage-wise many more people live in highsec than nullsec, and one of the reasons is that there aren't enough good reasons to live in nullsec. These changes are a step in the direction of making nullsec more attractive as a place to live (0.0 power blocs and meaglomaniacs controlling everything you do there notwithstanding). I look forward to this expansion. They could have problems with consumer protection laws. My box clearly states the install requires 30 GB, but to actually update it so you can play now requires 60. I agree that it's a tempest in a teapot. TBH, I don't find that I have a whole lot of need for money at all. I buy bank and bag space, and sooner or later I'll get a horse, but I'm crafting all my own gear and thus just don't have anything to spend my gold on anyway. Theoretically I'll have an impressive pile of cash when I hit the veteran ranks and might actually need to shell some out in order to get the better gear that I'm hearing is necessary for those levels. But that's a long way off yet. Since they keep the markets small due to having to join trading guilds to really be able to buy and sell anything anyway... I'm not really seeing this as a big deal. Maybe even a smaller deal than in any other MMO I've ever played since in them you tend to have a) faction-wie if not world-wide markets and b) a need for gold. The tech trees in EVE are move impressive than that ... heh, got in with an industry gag on entirely unrelated post! I must be building up to something momentous, or getting tired.